What is a chafer beetle? The European chafer beetle (Rhizotrogus majalis) is a new turf pest in the Lower Mainland that was recently identified in West Vancouver. It has been a serious pest in Eastern North America for some time and was first identified in New Westminster in 2001. It has since spread to many Metro Vancouver municipalities, causing considerable damage to lawns, boulevards and medians. Chafer beetle populations grow quickly, damaging turf on lawns, boulevards, grass sports fields and parks. The grubs feed on the roots of grass lawns. 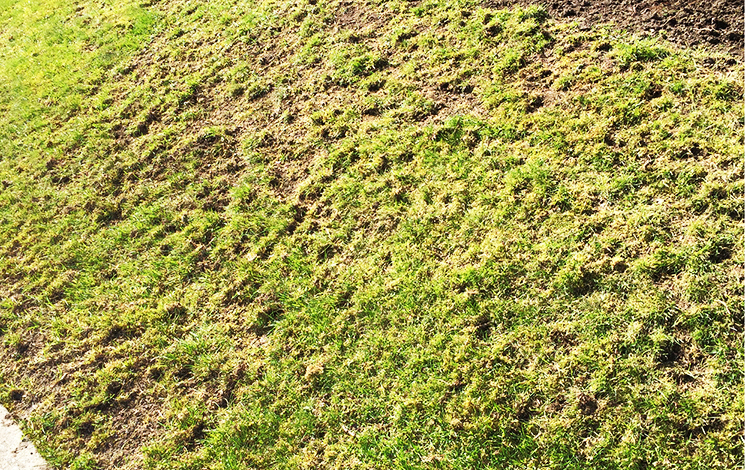 In drier weather, the damage appears as brown patches in the lawn. Birds and animals (especially skunks and crows) cause further damage by digging for the grubs. Damage by animals is most severe in the fall and spring when the grubs are rapidly increasing in size and feeding near the surface. Chafer beetles have a one-year life cycle. The only way to confirm the chafer beetle’s presence is through a simple test conducted between January and March. By digging up several test sections in both affected and unaffected areas, you can monitor for grubs while they are near the surface. Cut five sample sections that measure 30 cm x 30 cm (1 square foot). The grubs, measuring 2-2.5 cm, are soft, white and C-shaped with tan-coloured heads and six legs. If you count five or more grubs per square foot, control measures may be warranted. for healthiest roots, a lawn only needs to be watered one hour per week, or less if it rains. don't cut your grass too short. Beetles prefer laying eggs on closely cropped lawns, so raise your mowing height to 6 to 9cm (2.5 to 3 inches). The higher blades also help protect the soil surface from water loss and encourage deeper root growth. consider using alternative ground covers such as woody ornamentals on selected areas of your lawn. Some residents have had some success preventing chafer infestation with the use of Remay cloth, plastic sheeting, or landscape fabric to cover their lawns before dusk in June and July when the adult beetles are most active. A cover may prevent mated females from laying eggs in your turf and repeating the cycle. (Note that some covers may need removal each morning). The application of nematodes has proven to be the most effective approach to managing the chafer. Nematodes are microscopic roundworms that live in wet soil and feed on insect larvae. Note: Nematodes are most effective when applied the third or fourth week of July when the chafer larvae are small and most vulnerable to nematode infection. During treatment, the application area should be well irrigated early in the day so that there is no dry soil in the root zone.